Up until fairly recently, seahorses have been considered to be difficult to keep alive in an aquarium for any length of time. The first attempts were made using wild caught seahorses. These specimens usually perished in a few months either from starvation or infections. But once the seahorse-keeping pioneers determined how to breed them in captivity (aquaculturing) keeping seahorses in an aquarium long term became doable. Unlike wild caught seahorses, captive bred seahorses will readily take hand-fed food. Seahorses have an exoskeleton (like a crustacean) covered with a type of skin rather than scales. This makes the seahorse more susceptible to external injuries and infections than most fish. A seahorse's gills are not as well developed as most bony fish. There are over 30 recognized Hippocampus genus member seahorses that inhabit tropical, sub-tropical and temperate waters around the world, but only a handful of species are typically encountered in the aquarium trade. The smooth seahorse (Hippocampus kuda) and the lined seahorse (Hippocampus erectus) are the most common species of seahorses that are seen in aquariums. The dwarf seahorse (Hippocampus zostera) which, in the wild, is found in the western Atlantic Ocean, from Bermuda to the Bahamas, southern Florida and the entire Gulf of Mexico. As the name implies, this is a tiny creature that grows to be less than two inches in size, which makes it ideal for mini or nano-reef tanks. A seahorse tank should be at least 18 inches tall. Seahorses prefer to move up and down in an aquarium more than side to side. If you are going to keep more than one small seahorse or one of the larger seahorse species, you will want a larger tank. Because they are not strong swimmers (and because their gills are not very efficient), seahorses do not like strong water movement. Seahorses have a short and very primitive digestion tract, which allows a great deal of undigested food to end up on the bottom of the tank, adding to water quality issues. 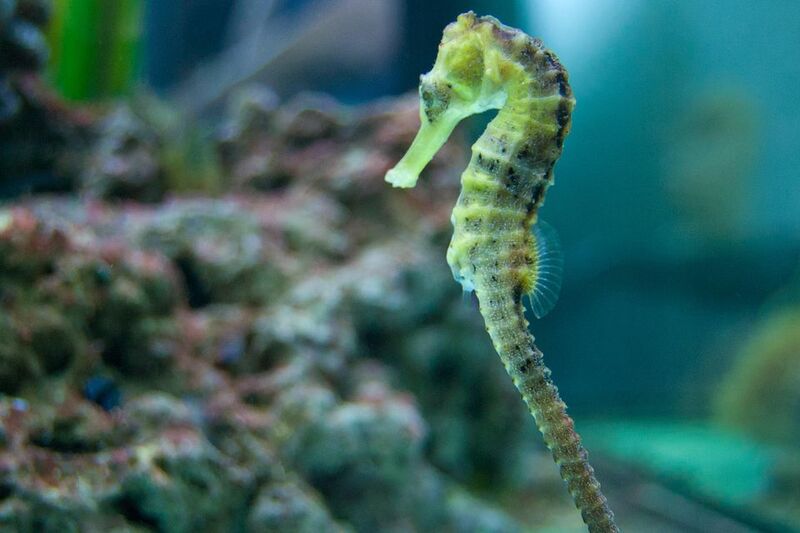 Seahorses need at least one hold fast or hitching post in the tank so they don't have to be constantly swimming. If they aren't looking for food, seahorses will spend most of their time with their tails wrapped around almost anything that will hold them in place. Gorgonians work great for hitching posts, as do faux corals or even plastic aquarium plants. Seahorses should be fed at least twice per day. The best food for captive bred seahorses is frozen Mysis shrimp. If you obtain an aquacultured seahorse, it is probably already eating Mysis, so getting it to eat in your tank should not be a problem. While you can just squirt some thawed Mysis into the tank and let the seahorses chase it around until they catch some, target feeding your ponies in a low water flow area of the tank will make it easier for them to get enough food without having to work too hard. Seahorses are not aggressive feeders so any fish or invertebrates you include in the tank should be slow, cautious eaters.